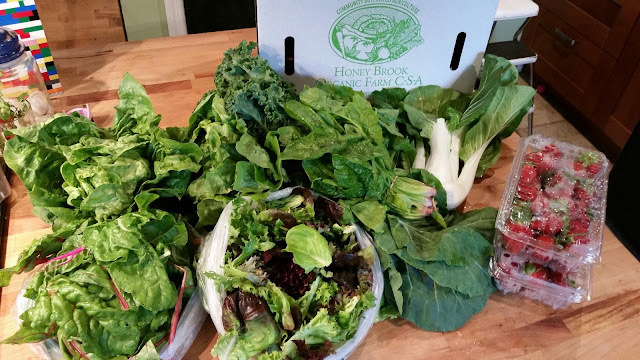 We picked up our official first premium boxed share on Tuesday: strawberries, bok choi, collards, spinach, kale, lettuce, salad mix and swiss chard. Everything was super fresh, with bright, green, crispy leaves. And unlike the strawberries you buy at the grocery store, each container was filled with perfect, firm and sweet strawberries with no random fuzzy moldy ones hiding in the box. The Boxed Share program has had an unusual number of setbacks for us this season. Our former driver, Chino, got married during the “off” season and decided to remain in Texas with his bride. After several rounds of interviews, we narrowed the field of replacement drivers to two, who accepted our offers but then decided not to report to work. Farmer Jim is now our delivery truck driver for the time being, but we are seeking to hire two professional drivers on a part-time, seasonal basis. I wish they had just said this earlier! It appeared (I don't know if this is true) but people with on-farm shares were picking up boxes before the boxed shares. If this was the reason, then be transparent. Tell everyone what is happening, we are supposed to be in this together. That's the whole point of a CSA. Maybe they could have offered people the opportunity to pick up on site until the situation was resolved. There were definitely better ways to handle this, but hopefully moving forward, they will continue to keep everyone better informed. They mentioned that this unusually wet weather has delayed the transplanting of some summer crops. I already knew about the tomatoes from their Facebook post, so I was prepared for this news. Again, I was totally cool with it, because they told everyone ahead of time. They also said the strawberry quantities were slowing down (we got 6 quarts with our Premium share last week, this week we'll get 3 quarts) and that blueberries won't be ready until June to early July. I wonder what that means in terms of PYO (pick your own) for the weeks in between. Again, a head's up to what the plan is would be nice. So far I'm happy with what I've gotten. I'm not happy that it seems on-farm pickup people got more benefits from joining the CSA than boxed share people. I'm not happy that Chesterfield seems to have started earlier and are giving out a greater variety of produce than Pennington. I am happy they are starting to be a little more clear with what's going on with the program, and I hope they start to understand the importance of that. I'll bump their grade from a C to a B-.